You are currently browsing the tag archive for the ‘Brown Mountain lights’ tag. … is finally available on Amazon! For some reason, Amazon hasn’t linked it to the ebook page yet but if you’d like a copy, just click on the picture below and it’ll take you to the print book’s page. We’ve been so busy dealing with this (plus a couple of other exciting things that we’ll share with you later) that I forgot to thank everyone for voting on the cover. As you can see, blue won. Thanks so much to our awesome readers who take the time to let us know what they think and are a constant source of support and inspiration to us. We love all of y’all! ,,,new book! Yep, that’s right, Through the Brown Mountain Lights, the first book in our Brown Mountain Lights Series is now available on Kindle! Wishing all of our awesome readers a wonderful holiday season! 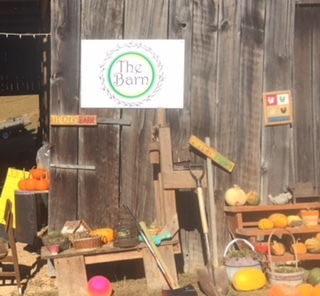 We had a great time at Woodson Branch Nature School on Saturday, October 29th. The weather couldn’t have been more perfect while we got the chance to meet readers, sign copies of our books, and enjoy the enticing smell of a chili cookoff. In between meeting the attendees, we also talked about and resolved issues with our new series, the Brown Mountain Lights series, which is close to being finished. We hope to give our readers a glimpse of the beautiful cover very soon so watch for it! Fall in the mountains is our favorite time of the year, and surprisingly the drought hasn’t affected the color of the trees which are beautiful, even more so when silhouetted against a fall cerulean sky. Afterward, we drove down the mountain to Hot Springs to have dinner at our favorite diner, then walked to Bluff Mountain Outfitters, where we found out our books had sold out and were more than happy to sell more of the books to them. If you ever visit Hot Springs, be sure to stop in at Bluff Mountain. They cater to hikers hiking the Appalachian Trail and it’s a great place to hang out or shop. 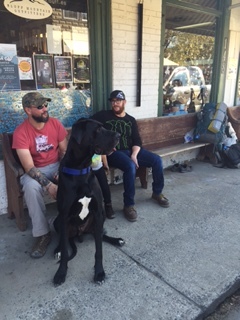 On our way out the door, we met the largest dog we’ve ever seen, a 2-year-old Great Dane named Briggs who was friendly and so adorable Christy wanted to take him home but couldn’t convince the owner to give him up. Before leaving, we visited Springbrook Cabins in Hot Springs to talk about booking an overnight stay when we plan to attend the Christmas festival in Marshall on December 9th and 10th. If you’re in the area at that time, we hope you’ll stop by and say hello. 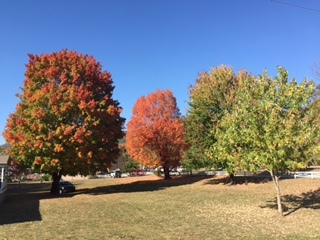 Christy took a picture of the trees outside the office there, which were too pretty to ignore. This week, we’re in Florida visiting our dad (the storyteller behind the Appalachian Journey series), while working on the first edit of the first book in our new series, tentatively titled Through the Brown Mountain Lights. The book will take place during the Antebellum period in the Appalachian Mountains and, like our Appalachian Journey series, is filled with herbal medicine, Catawba folklore and a bit of romance wrapped around historical facts. We’re adding a different twist to this one (think Outlander meets Cold Mountain) and hope our readers will enjoy it as much as they have the Appalachian Journey series. We’ll announce the release on our CC Tillery Facebook page so stay tuned! We had a wonderful day at the Old Fort Pioneer Day last Saturday. Beautiful weather although it was a bit cool to start and at times the wind was a little gusty, but overall, a gorgeous day to be outside. We met lots of new readers and a few who were already familiar with our books. Plus, we met two family members, Mary Paris Merriken and Melinda Paris, distant cousins through Aunt Bessie’s mother, Lucinda Henderson. Christy put up a picture of us all on the CC Tillery Facebook page. We also had the pleasure of meeting Patti Holda, Genealogy Assistant at the McDowell County Public Library who told us she’d had several people come in and request our books so she ordered them for the library. McDowell County Public Library also participates in an Interlibrary Loans program which makes the books available not only in McDowell County but in 65 other libraries in North Carolina. Added to that, we had people stop by our booth and ask us if we would be interested in attending two other festivals. We were also invited to meet with two production companies about our series in the near future, which is exciting! We’ll keep you posted on events as they unfold. All in all, it was a very good day for us and our books. The festival offered many interesting demonstrations of everyday life during the Civil War era. Everything from basket weaving to quilting to grinding corn into corn meal like they used to do it. So glad I can go to the grocery store and buy corn meal whenever I want cornbread! And lots of people were there dressed in period dress. All of that was great since we will be writing about that time in our new series, the Brown Mountain Lights Series. In between the re-enactments of the Civil War battles, there were a lot of soldiers walking around carrying muskets. Several times during the day, the re-enactors performed a 21-gun salute using their muskets, which was as loud or louder than the cannon, pictured to the right, and which always managed to catch us by surprise. After the second time, we learned there would be two more volleys following the first which allowed us to brace ourselves. That first volley got us every single time though! The best part for us was that we had time in between all this to discuss the new series and brainstorm on the characters, the setting, the conflict for the first book, and the paranormal aspects and how they’re going to work. We’re excited about the first book in this new series, and after Saturday, it’s beginning to take shape in our minds. We’ve already written the first two chapters (only a rough draft, they still need a lot of work!) and are looking forward to bringing it to you, our amazing readers, as soon as we possibly can. Stay tuned! 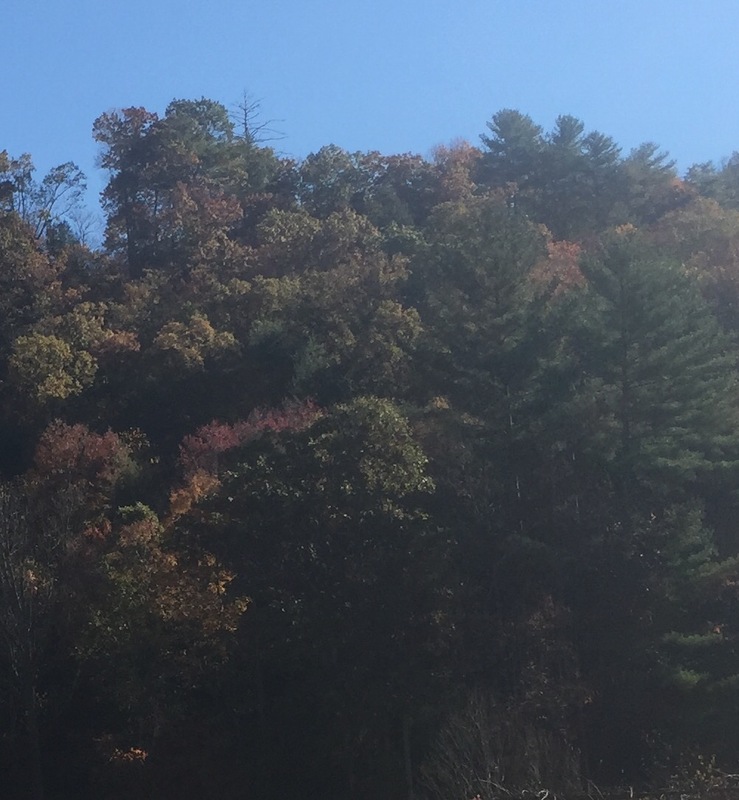 We spent last weekend in beautiful Morganton, North Carolina researching the new series–and enjoying some really awesome scenery, including Brown Mountain, Table Rock, and lots of historical buildings in downtown Morganton. It’s an amazing place and we met some very helpful and informative people who helped us get a feel for life in the town and around Brown Mountain in the 1850s which is where and when the first book of our next series takes place. This one is going to be a little different from the Appalachian Journey series … it’s still historical fiction with a touch of romance–well, maybe more than a touch, we haven’t exactly figured that out yet!–with a bit of paranormal thrown in. We’ve been trying to decide what genre it will fall under but haven’t had any luck yet. Historical Paranormal Fiction? Paranormal Historical Romance? Whatever, think Diana Gabaldon’s Outlander series only in 19th century Appalachia. Anyway, back to our research trip. We’ll start with the town of Morganton, First up, we visited the Chamber of Commerce/Visitor Center and met Ed Phillips, the town’s Director of Tourism. Ed was very welcoming and helpful (the same can be said for all the people we met). He’s directed several symposiums on the Brown Mountain Lights and knows quite a bit about them, the legends behind what causes them, and the general area (most of which we’re keeping under our hats for now since we don’t want any spoilers to get out about the series). Ed also directed us to the historical Morganton Courthouse, a gorgeous building, and told us to see Joan Malloch, the President of the Board of the Morganton Historic Foundation. Joan walked us through the building and shared numerous stories about its history and some of the notable trials that took place there. She also told us about the Charles McDowell, Jr. House which still stands on the grounds of the Quaker Meadows Plantation–no pictures of that. That’s the courthouse to the left. Isn’t it gorgeous? Wish we had gotten a picture of the winding staircases on both sides. After we left the courthouse, we went to the Morganton Historic Museum and talked with the people there and then the Burke County Public Library’s North Carolina Room where we met Dottie Ervin who was extremely knowledgeable about the history of the town. She spent a long time pulling files for us to look at and told us about Demon’s Hill where they used to hang people. The library and the grounds surrounding it are … I’m running out of words …beautiful, gorgeous, stunning … how about breathtaking? And finally, after all that, we drove up to the overlook to see Brown Mountain. That’s it on the left, on the right of the “V” in the mountains. It was right at sunset, so we didn’t get to see any lights, and truthfully, we weren’t sure we wanted to see them after hearing the legends. (Some people believe whenever the lights are seen, people disappear. Yikes! Don’t want that –we have a book to write!) The picture on the right is of Table Rock. Sorry it’s not very clear! We were in a moving car when we took it! And that about sums up our weekend in Morganton, except to say we spent a lot of time talking about the book, we know our protagonist’s name and the names of the sisters who find her on Brown Mountain and take her in, and we have the time, setting and a tentative outline for the first book. And we also have an opening we both love, so now, all we have to do is start writing. Fingers crossed it goes as well as our trip to see the setting. For those fans of our Appalachian Journey series, we’ll continue with our readers’ favorite themes, herbal medicine (as well as other forms of medicine practiced at that time), Native American legends and culture, and stories about the Appalachian mountaineers along with historical events of the time. Stay tuned for updates! Okay, so we released Wise Woman, the final book of our Appalachian Journey series, in e-book on the 29th of January December (sorry, got ahead of myself), and in 3 days it’s already made it onto three bestseller lists on Amazon. Needless to say, we are thrilled and, of course, want to thank all of our wonderful readers–the absolute best readers in the world! … and then Christy, her husband Steve, and granddaughter Gabi traveled over the mountains to spend New Year’s Eve and New Year’s Day with me and my husband. We went Bear-footin’ on Main Street in beautiful downtown Hendersonville. That’s Gabi to the left posing with the hated Yankee bear (sorry Meghann, it broke my heart too!). Then we had a wonderful dinner and did a little shopping at Dancing Bear Toys and Mast General Store. A peaceful, relaxing New Year’s Eve which is just what Christy and I needed. Then this morning we went to breakfast and decided to go to Chimney Rock/Bat Cave/Lake Lure to play tourist and do a little sightseeing and more shopping. Chimney Rock is where they filmed the waterfall scene in The Last of the Mohicans. That’s the waterfall on the left. Even on a dull, dreary day in winter the Blue Ridge is filled with beautiful scenery. Bat Cave is a tiny little town nestled in between Chimney Rock and Lake Lure. No pictures of Bat cave but we did buy sweat shirts. As for Lake Lure, it’s where they filmed the movie Dirty Dancing. That’s the bridge over the Broad River in Lake Lure on the left. It’s a beautiful little town and they have a Dirty Dancing Festival in the summer. Today, New Year’s Day, they were having the Polar Plunge where all the idiots brave souls jump into the lake. Brrr! So anyway, while we were eating/shopping/sightseeing/taking pictures, Christy and I were talking about the feedback we’ve gotten on Wise Woman from readers who have already read it. Specifically, how almost all of them said they loved the book, they were sad to see the series come to an end. … we decided we’re not finished yet. We have the bare bones of a new series centered around the legend–not sure if that’s the right word since it has been witnessed by people. Perhaps mystery works better–of the Brown Mountain Lights in Burke County, North Carolina (for more info, click on the name.) This is a phenomenom we’ve heard about for years and even had one of our readers call it to our attention too. We even talked about putting it into Wise Woman but it got lost in the shuffle somehow. Also, a couple of months ago, we had another reader mention that we should write a series about the Walker Sisters from Sevier County, Tennessee. We did some quick research and while it’s interesting, we found there were already several books written about them so we nixed the idea and didn’t think anymore about it. But now with this new series we thought we could incorporate characters similar to the Walker Sisters with the mystery of the Brown Mountain lights. That way we could stick with our favored Appalachian Mountains and the mountain people we’ve come to know and love. And there you have it, our big news for this new year of 2016 is we’re writing another series. Funny how our relief and resolve only lasted a couple of days. No title yet and we can’t promise we’ll have the first book out in a year like we did with the last three of the Appalachian Journey series-it took us 3 years to research the first book in that one–but stay tuned. We’ll be posting about the development of the new series and on our progress soon. Meanwhile, Happy New Year to all our cherished readers and everyone else! We hope it’s one filled with love, happiness and peace for all of you!